Synthetic peptide corresponding to Human RHAG aa 350 to the C-terminus. Human fetal kidney, fetal liver and bone marrow lysates; Human lung and spleen tissues. Our Abpromise guarantee covers the use of ab155094 in the following tested applications. WB 1/1000 - 1/10000. Predicted molecular weight: 44 kDa. RHAG (Rhesus blood group-associated glycoprotein) is associated with rhesus blood group antigen expression. It may be part of an oligomeric complex which is likely to have a transport or channel function in the erythrocyte membrane. The Rh blood group antigens are associated with human erythrocyte membrane proteins of approximately 30 kD, the so-called Rh30 polypeptides. 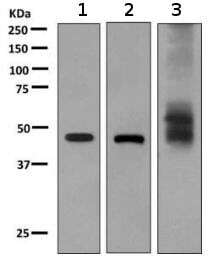 Heterogeneously glycosylated membrane proteins of 50 and 45 kD, the Rh50 glycoproteins, are coprecipitated with the Rh30 polypeptides on immunoprecipitation with anti-Rh-specific mono- and polyclonal antibodies. The Rh antigens appear to exist as a multisubunit complex of CD47, LW, glycophorin B and play a critical role in the Rh50 glycoprotein. 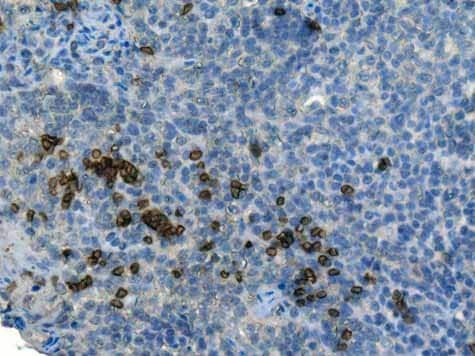 ab155094 showing +ve staining in Human normal tonsil. 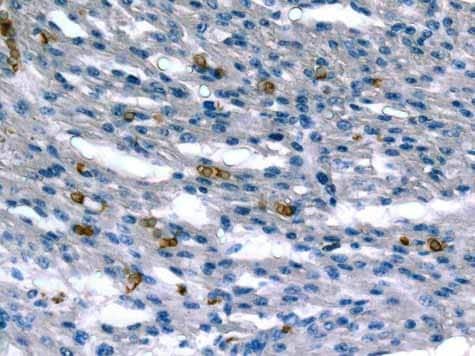 ab155094 showing +ve staining in Human normal heart. 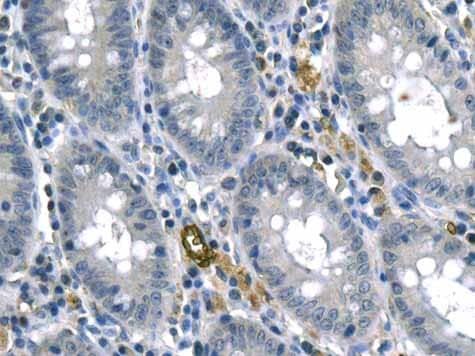 ab155094 showing +ve staining in Human normal colon. 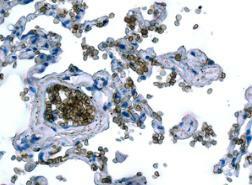 Immunohistochemical analysis of paraffin-embedded Human lung tissue labeling RHAG with ab155094 at 1/250 dilution. 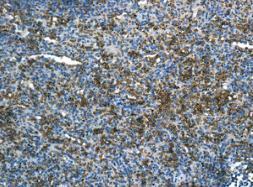 Immunohistochemical analysis of paraffin-embedded Human spleen tissue labeling RHAG with ab155094 at 1/250 dilution. Publishing research using ab155094? Please let us know so that we can cite the reference in this datasheet. There are currently no Customer reviews or Questions for ab155094.